Ringworm is a skin infection caused by a fungus. Ringworm can affect skin on your body (tinea corporis), scalp (tinea capitis), groin area (tinea cruris, also called jock itch), or feet (tinea pedis, also called athlete's foot). Often, there are several patches of ringworm on your skin at once. Ringworm is a common skin disorder, especially among children, but it may affect people of all ages. Although its name suggests otherwise, it is caused by a fungus, not a worm. Many bacteria and fungi live on your body. Some of these are useful to you and your body. Others can multiply rapidly and form infections. Ringworm occurs when a particular type of fungus grows and multiplies anywhere on your skin, scalp, or nails. Ringworm is contagious. It can be passed from one person to the next by direct skin-to-skin contact or by contact with contaminated items such as combs, unwashed clothing, and shower or pool surfaces. You can also catch ringworm from pets that carry the fungus. Cats are common carriers. 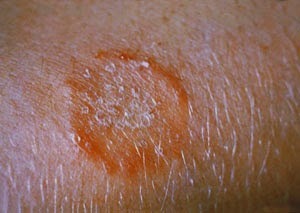 The fungi that cause ringworm thrive in warm, moist areas. Ringworm is more likely when you have frequent wetness (such as from sweating) and minor injuries to your skin, scalp, or nails. Itchy, red, raised, scaly patches that may blister and ooze. The patches often have sharply-defined edges. They are often redder around the outside with normal skin tone in the center. This may create the appearance of a ring. Your skin may also appear unusually dark or light. When your scalp or beard is infected, you will have bald patches. If nails are infected, they become discolored, thick, and even crumble. Wash sheets and nightclothes every day while infected. Infected pets also should be treated.